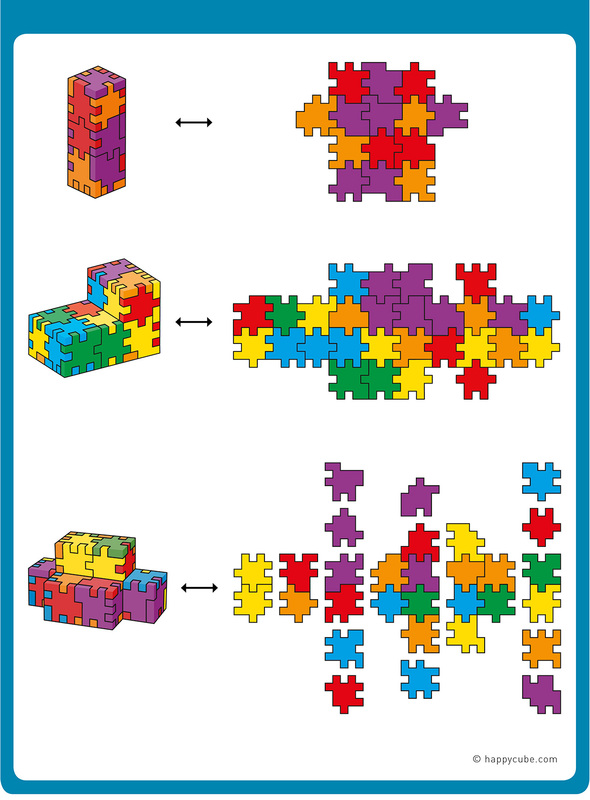 Happy puzzles help you to develop many skills in a fun way, for all ages. 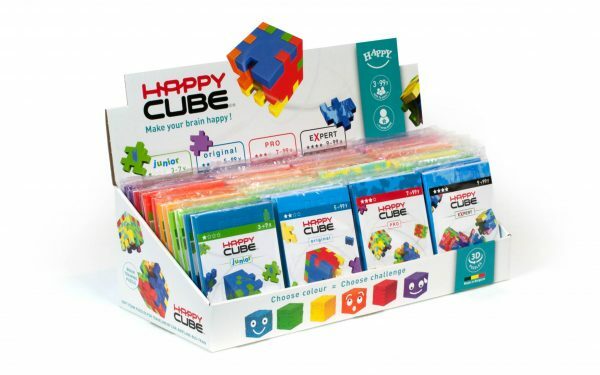 Happy Cube trains your ability to visualize with the mind’s eye. You solve spatial problems and learn to notice fine and subtle details. 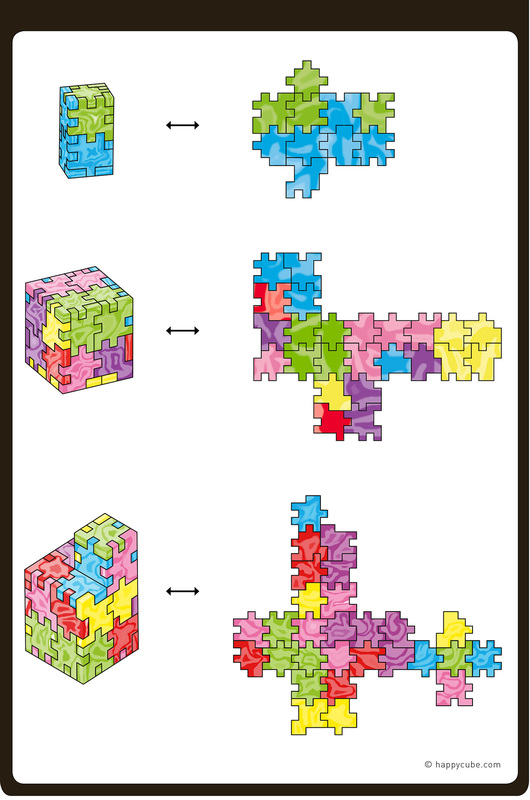 These 3D puzzles stimulate your three-dimensional and spatial insight like no other toy can. 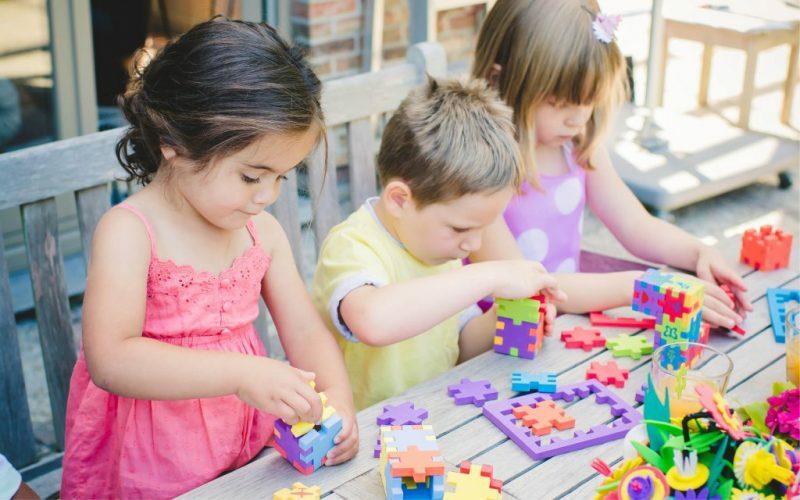 Smaller children will improve their ‘mind versus body’ coordination while building 3D cubes and constructions. Additionally, the colourful and skin soft puzzles stimulate your fundamental senses of seeing and feeling. The value of completing challenges, lies within growing your self-esteem and raising the bar for yourself. While you encounter first challenging, and then emotions of success, you learn how to handle changes and be flexible. 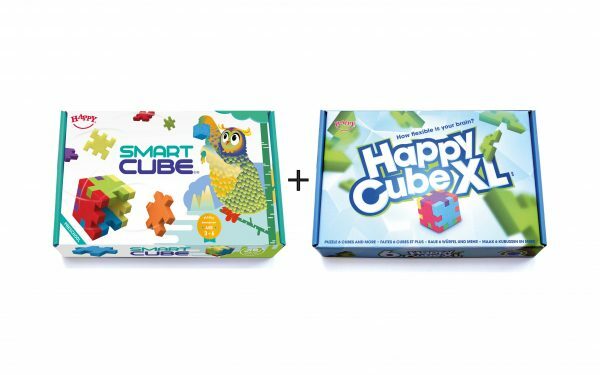 Happy Cube strengthens your logic, conceptualization and problem solving intelligence. Your concentration span is triggered and will expand since your goal is to complete the puzzle challenges and declare victory. 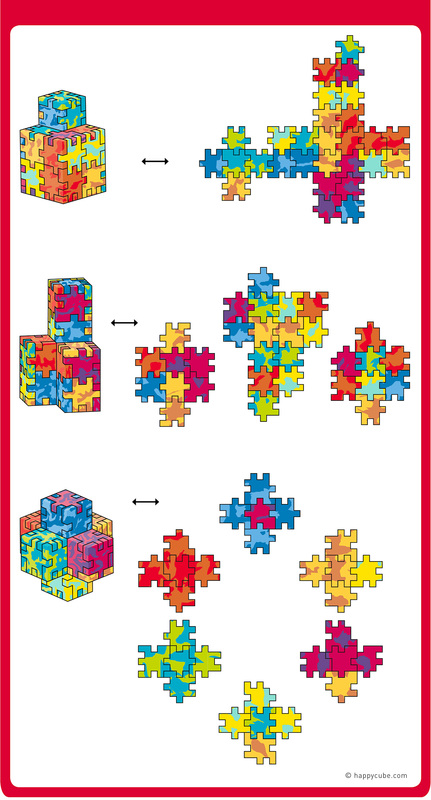 During puzzling children can learn how to share and interact appropriately, as well as how to perform cooperative tasks. 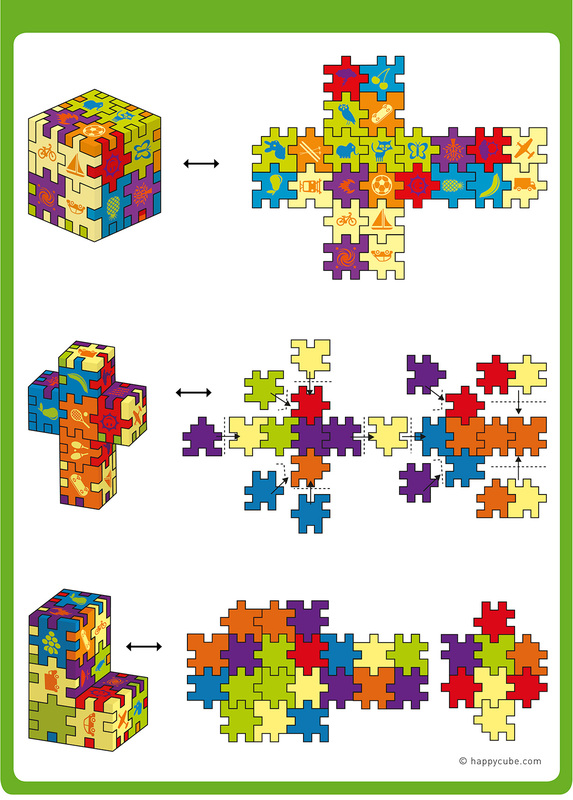 Our puzzles encourage productive social behaviour, while children give each other help or tips and tricks. Teachers love Happy Cube for their classroom! and ensure quiet, safe and focused play. 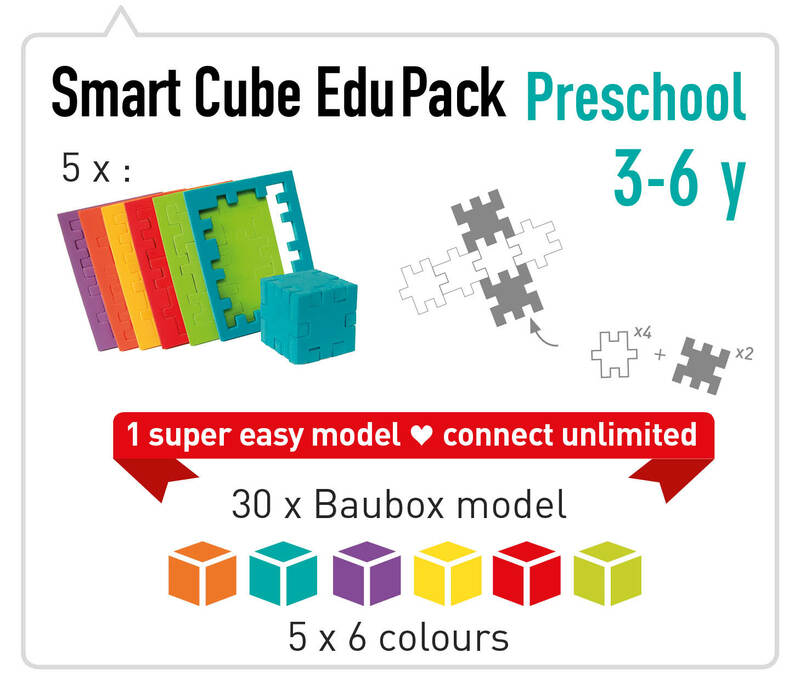 The Smart Cube EduPack is especially developed for larger groups of the smallest pupils (3 to 6 years old). The Happy Cube XL is designed for children and playful adults (5 to 99 years old). We always welcome questions and feedback from educators. 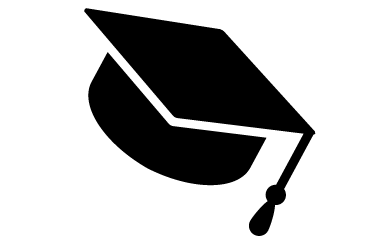 We are happy to help you in making the right choice for your school. If you would like to make a purchase for your school, please feel free to contact us at any time. 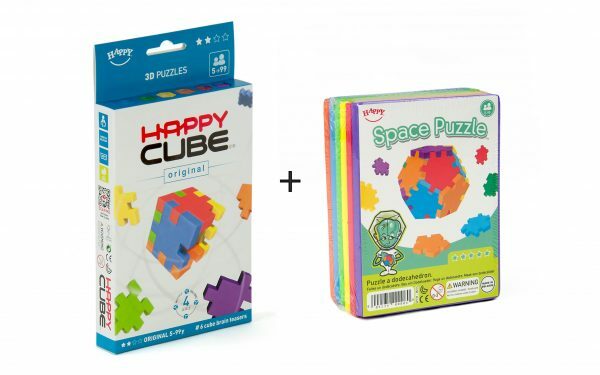 When you accept the Happy puzzle challenge, you first THINK about how you are going to make the cube. During the puzzling you ACT with your hands and actively explore the surface and the shape of the puzzle pieces. While playing you get visual feedback from your eyes, hands and fingers and emotional feedback from your heart. Finally, when you create the perfect cube, you FEEL HAPPY! Since multiple senses are used, the learning is deeper grounded in brain and body, and therefore remembered better and longer. Have you also got the feeling that it is better for children to play with ‘real’ toys than with electronic devices? Nowadays many parents’ 6th sense tells that it is better to physically play with toys than to spend hours playing with electronic toys like tablets and smartphones. But apparently their 6th sense is now also scientifically validated. Research has shown that stronger brain connections are made when children use all their senses when playing a game. Haptonomy is a holistic approach, which recognizes humans as whole beings, gifted with reason and a wealth of emotive and sensitive powers. The haptonomic focus is body directed, on the affective and tactile sensations as important information source. The haptonomic study has been always postulating what neurosciences are now just beginning to prove: sensations, emotions and feelings are of capital importance for the development of the psychological life and intellectual capacities1. Consequently are toys, which let you use all your senses while playing, called haptonomic. Dolto-Tolitch, C. (1997). Pre- and postnatal Haptonomic communication, affective security and development. The International journal of prenatal and perinatal psychology and medicine, 9(2), 165-180. A child in development needs to encounter the appropriate stimuli in his/her environment to train and prepare the brain and body for later functioning in the society and workplace. When children play with electronic toys like tablets and smartphones, only superficial brain connections are made since no tactile feedback by touch is received while playing. Hence, due to this passive contact no haptic or touch perception is established and what is learned is forgotten easily. Even worse; the renowned German memory researcher Manfred Spitzer1 warns that too much computer use leads to ‘digital dementia’, memory deterioration, voice and learning disabilities, attention disorders, stress and depression. Spitzer, M. (2012). Digitale dementie: hoe wij ons verstand kapotmaken. Antwerpen: Atlas Contact. However, when people play with the haptonomic Happy Cubes, stronger and solid brain connections are made because multiple senses are used during active exploration. Haptic perception is established through the ‘touch and feel’ play dimension. Likewise the information gathered from different senses support and reinforce each other, resulting in deeper learning and body awareness. Thus, the more different senses are addressed, the stronger the brain synapses and the better memories are established. The Happy Cube stimulates locomotion: playing with the cubes demands a number of motoric action. 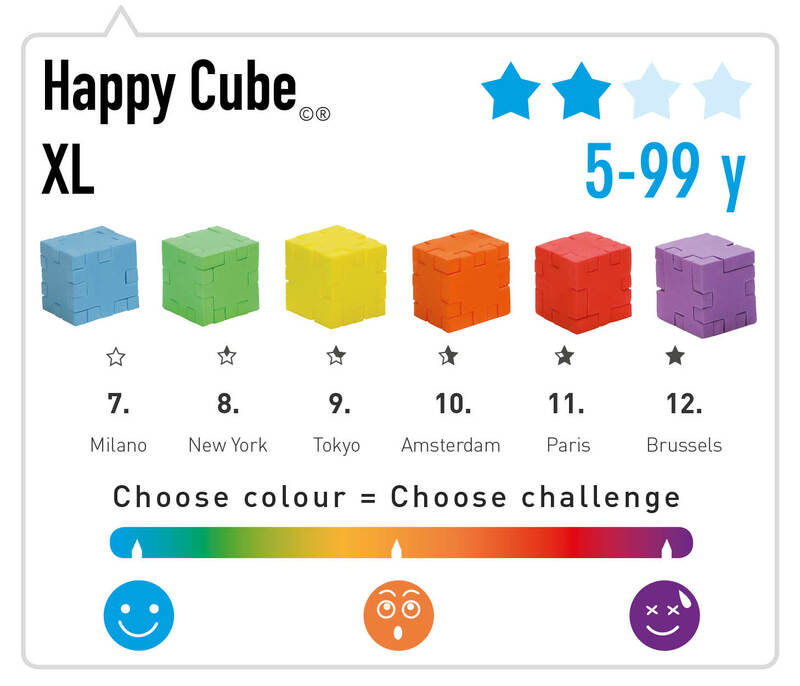 On the basis of these results, it can be concluded that the Happy Cube can effectively be used as pedagogical material in order to give children the possibility to develop their spatial analytical skills. Furthermore, the soft foam material appeals to children and calls on their curiosity and enthusiasm. During schoolyear 2010-2011 we did some research in a kindergarten in Ooigem (Belgium). We tested how 59 toddlers, who have never puzzled 3D before, reacted on the Smart Cube puzzle model. The children had to make a perfect cube, a tower and a bridge within a limited amount of time. They were divided into four groups and each group received a different instruction (in word, as a drawing, as outlines or a replicate on paper). We wanted to know which instruction worked best. Most of the children were capable of making a perfect cube within 5 minutes (63%); 39% succeeded in making the tower and 12% completed the bridge within 10 minutes. Toddlers prefer instructions as outlines or as replicates. All toddlers were capable of cleaning up all the puzzles neatly in 5 minutes time. This cleanup phase provides the opportunity for every child to feel happy and successful. 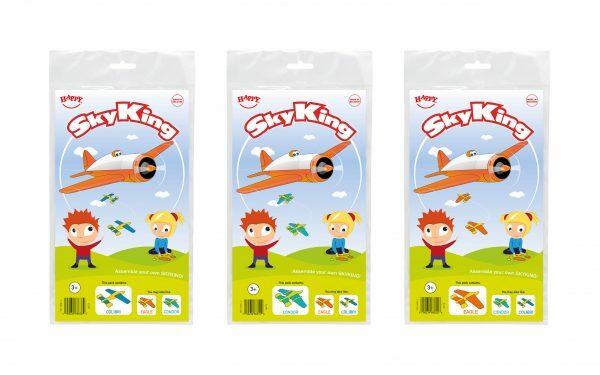 Last but not least, we acquire a lot of hands-on experience with play days and puzzle workshops, that we and our distributors organize in Belgium, the Netherlands, Germany, Poland and many others. During these workshops we invite people to puzzle with the Happy Cubes. The first group of people puzzle at random and try to combine the puzzle stones without making a strategy. The second group of people carefully observe the puzzle stones for a relatively long period and, after figuring out which stones would match, they combine them and succeed faster in making a perfect cube, in comparison to the first group. On the basis of our extensive research and our many years’ experience, we are convinced that our Happy 3D puzzles are a playful added value for children and grown-ups in their day-to-day development. And above all… they put a huge smile on your face! In our 25 years of experience we have done some great cooperations. 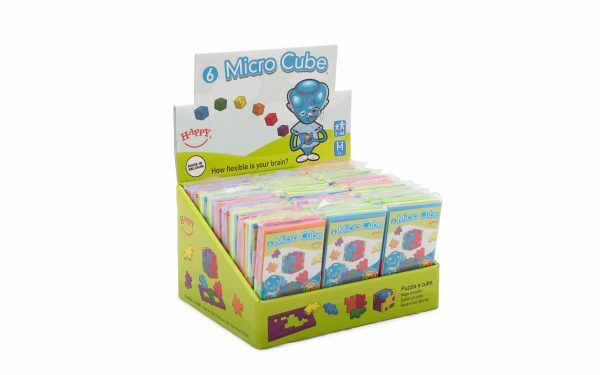 We made a customized Little Genius (Happy Cube Junior) schoolbox 4 cm cubes, with 1 colour print, and challenge cards. This was a special for the world famous Kanguru math competition. 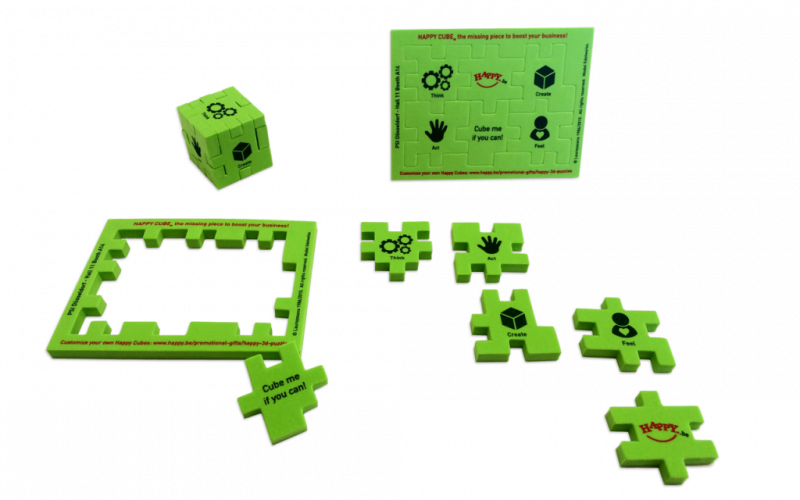 For the Nasco educational school supplier (US) we made a custom Happy Cube set, which is included in a box with specialized STEM developing games. Please feel free to contact us at any time for more information on cooperation for your specialized eduction project. Do you like to explore combinations without errors? We advice you the Happy Cube Solver Software. This software enables you to design your own constructions, and shows you the exact steps to create these sensational pieces of art. You can design a shape, indicate which Happy Cubes© you have and the program shows the solution and the steps you have to follow. Based on OpenGL, the software integrates a graphic engine for creating and viewing Happy Cube combinations and a powerful AI engine for solving them. This interactive environment for building Happy Cube combinations is written by Shy Shalom. We granted authorization to him to create the software, under explicit reservation of our rights on the Happy Cube Puzzles. The software is released as OpenSource on sourceforge.net. Using this program automatically implies that you respect the copyrights on the Happy Cube©® puzzles. Modification of this open source program and it’s specific content is only admissible after consultation and authorization.